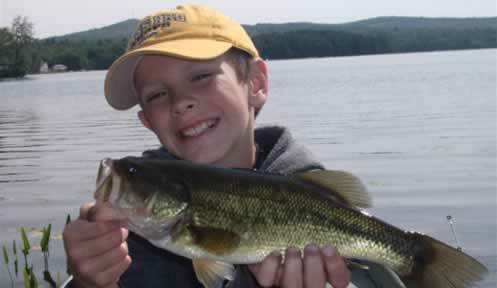 Fishing is a New Hampshire tradition, one that we strive to pass on to present and future generations. With greater than 70% of New Hampshire’s land under private ownership, access for most shoreline and stream fishing occurs over private property. If we are to maintain the New Hampshire fishing tradition, it is important to remember that access to private land is a privilege provided to us through the generosity of landowners sharing their land. Practicing positive landowner relations is the key to maintaining access for present and future generations of anglers. If your request is denied, be understanding and remain polite, whether the landowner explains the reason for the decision or not. Often times you will find the landowner does allow access, but has already provided permission to a number of anglers and feels that additional anglers will create over-crowding. Ask the landowner where you should park, and if there are any areas or times, they would prefer you not to fish. Remember that written landowner permission is required to operate any OHRV including trucks, cars and all terrain vehicles on private property. If the landowner grants permission, understand clearly where you can and cannot drive or park your vehicle. Always ask the landowner for permission if you want to clear a trail, cut any trees, limbs, or brush. Be careful and conservative in using all vehicles and abide with restrictions of the landowner. Never park on lawns, in or block driveways, roadways, trails, crossings or gates. Always leave gates or other barriers the way you found them. Do not walk through crops without permission. Always cross fences in a manner that will not break or loosen wires or posts. Do not cut trails to the water without permission. Remember that many landowners derive part or all of their income from the land upon which they are allowing access, and any damage you create will affect their ability to earn a living. Do not clean fish in and around water bodies, especially when the area that you are fishing is in the landowner’s back yard. If you plan to fish in close proximity to the landowner’s residence before sunrise or after sunset, always obtain permission to do so and let them know when you will be there. Use flashlights conservatively and keep them pointed to the ground and remain quiet, especially early in the morning. Remember that access was a privilege granted to you through the generosity of the landowner sharing their land with you. Make every effort to express your appreciation and offer to assist with tasks that landowner needs help with. Visit the landowner to express your appreciation and provide them with a few fresh filets. Follow up with a personal note after the season thanking the landowner and consider providing a token of your appreciation such as a gift certificate to a local restaurant. 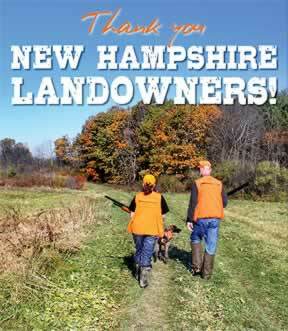 For more ideas on how to thank the landowner check out our Thank the Landowner Page. Access is one of the greatest challenges facing New Hampshire anglers and a significant threat to the future of the sport. Remember that through your actions, you represent all anglers. The impression that you make not only determines if you have a place to fish, but also that of your fellow anglers. Always be the best ambassador of fishing that you can be in your actions and words. For many, one of the most exciting and memorable fishing experiences will be that of mentoring a young angler. As part of the mentoring process it is important that they understand that if we are to preserve our fishing heritage, we must respect landowners and their land. Consider providing them with an opportunity to ask a landowner for permission and to express their appreciation after the trip. Fishing is a New Hampshire tradition, one that will only continue if we all follow the basic principle of landowner relations. 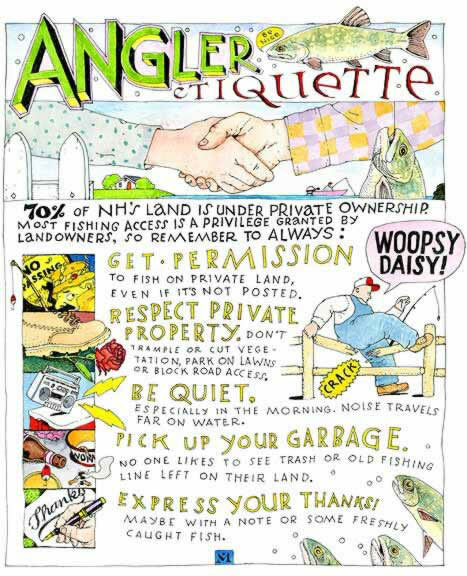 Treat the landowner, as you would like to be treated and treat their land, as you would like yours to be treated. As you land your first fish of the season, take a few moments to reflect upon the partnership between Fish and Game, anglers, and most importantly private landowners, which has provided you with this opportunity and consider what you can do to ensure that it will continue to be available for future generations.